Federal Home Loan Bank of Chicago has been one of the pioneers in implementing an integrated risks and controls re-engineering program for an integrated and organization-wide risk governance structure. The program involved creating a framework of industry best practices to provide greater transparency and consistency to the risk and governance process across the organization, particularly to managers, executives and the Board. Federal Home Loan Bank of Chicago successfully changed the “compliance focused” culture to a “risk management” culture which helped them streamline their risk management processes, build a consistent and sustainable risk management approach, enhance visibility into risks, and integrate risk into decision-making. 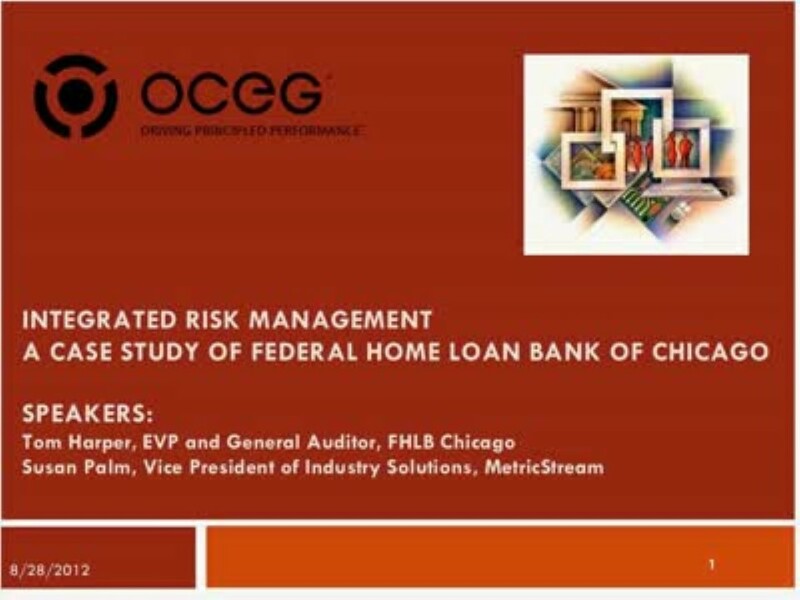 The webinar will provide further insights into the best practices implemented by Federal Home Loan Bank of Chicago to integrate their risk management and GRC program which, in turn, won them the 2012 OCEG GRC Achievement Award.